Property Location In the heart of Odessa, Comfort Inn and Suites is close to Ellen Noel Art Museum and Presidential Museum and Leadership Library. 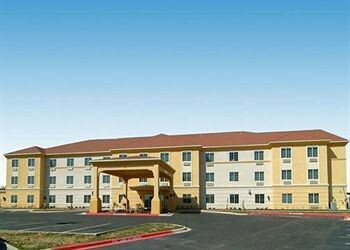 This hotel is within the vicinity of Parker House Museum and Globe of the Great Southwest.Rooms Make yourself at home in one of the 80 air-conditioned rooms featuring flat-screen televisions. Satellite television is provided for your entertainment. Conveniences include phones, as well as coffee/tea makers and irons/ironing boards.Rec, Spa, Premium Amenities Don’t miss out on recreational opportunities including a fitness center and a seasonal outdoor pool.Dining A complimentary buffet breakfast is included.Business, Other Amenities Featured amenities include a business center and a safe deposit box at the front desk.